Umbrella strollers, so called because of their ability to fold up easily and because they have rounded handles – just like umbrellas, have some great attributes. They are lightweight, compact when both folded and unfolded and they are the easiest to transport when not in use. A good umbrella stroller doesn’t sacrifice in other areas either. When you’re looking at double strollers then weight, size and ease of use become even more important. It’s no surprise that double umbrella strollers are a popular segment of the double stroller market. Parents of multiple children will know that minimizing the weight of the stroller is a priority as having two kids in the stroller will make it heavier, not to mention that double strollers are notorious for being bulky and heavy. Double umbrella strollers are the answer to this problem. 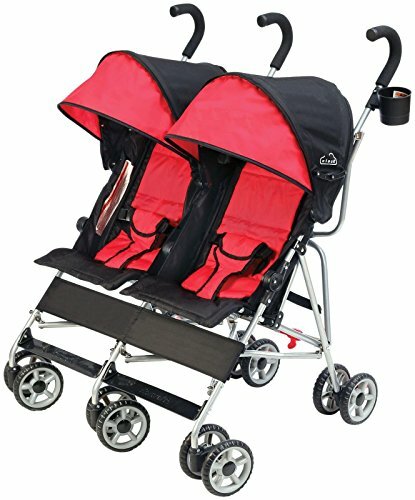 1.2 What is a double umbrella stroller? 1.3.1 1. What size are your kids? 1.3.2 2. Do you need the seats to recline? 1.3.3 3. How often and how will you use this stroller? How much does portability matter? Looking for the best umbrella double stroller? The chart below will help you compare all the best ones. Simply look at whichever criteria is the most important to you. The weight capacity is per seat. * = These strollers can hold 110 pounds in total. Like the name suggests double umbrella strollers are umbrella strollers that have two seats. Generally, they weigh under 30 pounds and are a perfect choice if you travel or are out and about a lot. They fit inside the trunk of a car and are not an issue for checking in for a flight. By their nature, double strollers tend to be large and bulky so if you are searching for the best lightweight double stroller then you will probably find that this is also the best lightweight double umbrella stroller. Double strollers won’t get more lightweight and compact than a good double umbrella stroller. That’s why they are such a popular choice. There’s some downsides, though. The first is that they are not made for rough terrain or jogging as their wheels are small. Jogging with a double umbrella stroller is not recommended. Also they are usually not suitable from birth as they don’t recline to a flat position, although some are suitable from 3 months and the Maclaren Twin Techno is suitable from birth. When you are picking the best umbrella double stroller for your family, there are a few questions you should ask yourself to ensure you find the perfect match. 1. What size are your kids? Many parents purchase a stroller with the thought that will never be buying one again. Sadly, this is not always the case but it can be done. If you want a stroller that can be used until your child no longer requires one, then you will usually need one that holds up up 40 lbs per seat. Some two year olds can be heavier than 40 pounds. If your children are heavy then a bigger weight capacity – like that of the Maclaren Twin Triumph – is vital. 2. Do you need the seats to recline? For younger kids, a reclining seat is a must and the need for a double umbrella stroller with reclining seats is essential. Reclining seats allow your child to lay flat whilst napping and also mean the stroller can be used for younger children, Some kids nap sitting upright but a reclining seat makes napping easier. If you do not need a recline feature then buying one without it, such as the Delta Children City Street, can save you money. 3. How often and how will you use this stroller? How much does portability matter? Whether traveling, driving or simply running errands, the portability of the stroller should be a factor in your decision making as every day there will be a lot of folding and unfolding of the stroller. Double umbrella strollers are easily the lightest weight option in terms of double strollers, and are generally more compact and portable than other double strollers. This does not mean all umbrella double strollers are created equal. Some strollers, like the ZOE XL2 Bext Xtra Lightweight Stroller, are no heavier than a single umbrella stroller. It is worth mentioning that this usually comes at the sacrifice of additional features, so you should consider just how lightweight the stroller needs to be. For most parents on the go, a lightweight double umbrella stroller is around the range of 25 lbs. Double umbrella strollers are the best choice if you need to travel with a double stroller. 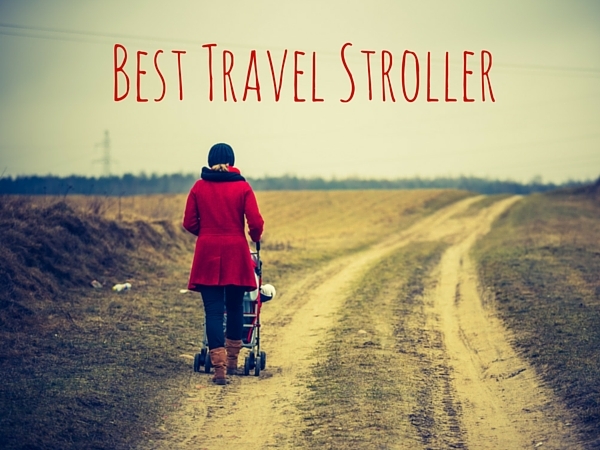 All the options below will make good traveling double strollers. That said, the more compact and lightweight the better. The best lightweight double stroller for travel will work well with limited space. For this reason, these are the qualities you should use to judge the best stroller for travel for your kids. If reclining seats aren’t important for you then it is hard to overlook the lightest double umbrella stroller, the Delta Children City Street Side by Side Stroller. Its price means it isn’t a disaster if it gets damaged or lost during transit or as a result of being checked in for a plan trip. However it has support for only 35 pounds per seat and so may not be an option of you have toddlers or preschoolers. If you want to take a stroller traveling with more features, particularly a nice recline in the hope of some naps, then the Maclaren Twin Triumph is a great choice. This stroller not only features a 4 position recline, but is suitable to hold 110 pounds in total which means you should be fine with even two preschoolers in the stroller. The compact fold and carry strap also make this a great choice for travel. Another great choice is the UPPAbaby G-Link Stroller. It is suitable from birth, is a low 24.5 pounds and has some great features. UPPAbaby knows how to make great, lightweight strollers. However for portability it is impossible to go past the ZOE XL2 BEST Xtra Lightweight Double Stroller. Weighing just 16 pounds and folding up very compact it is easy to carry and transport. And it supports 50 pounds per seat, making it good for a wide range of ages. This is our top pick as long as your kids are at least 6 months old. This stroller allows your children to sit side by side and chat and babble to each other as much as they like, entertaining each other whilst you move around. 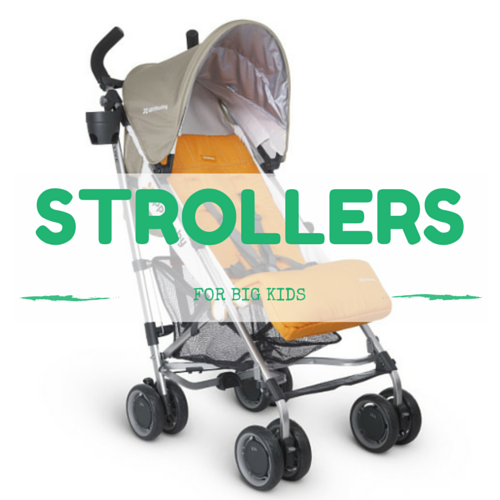 You can choose between green, grey, orange, or black in appearance, and overall the stroller looks fantastic. There is a large canopy to cover little eyes from sunlight, wind, and rain, an included parent cup holder, and two attachment points for shopping bags. Each child will also be safe with a five point harness safety feature, and the stroller also meets and even exceeds all safety requirements. The front wheels are 360 degree swivel type, with shock absorbers installed. The lightweight frame means this stroller is easy to zip around, and the compact umbrella fold makes for perfectly easy travel requirements and storage. Each seat also reclines to different settings, to give each child the comfort they need and deserve. The ZOE XL2 BEST Xtra Lightweight Double Stroller (I’ll call it the ZOE XL2 for short) is a great stroller with one compelling feature. The ZOE XL2 is super lightweight, weighing in at just 16 pounds! That’d be good in a single stroller. In a double stroller it is incredible. If you are looking for a double umbrella stroller for travel or one you can just carry around a lot then the ZOE XL2 is it. And for a side by side stroller it’s quite narrow, too. It’ll fit through a typical 30″ doorway. That’s very useful in and of itself. It is easy to see why this is such a popular double umbrella stroller. The seats go back a nice 135 degrees and feature a five point safety harness. Each of the canopies is quite large and while it won’t block out everything they will cover your children’s head easily from all but the sun coming in from dead ahead. The carrier basket, often overlooked as a factor but very useful, is quite large and easy to get to. As a nice extra you get two cup holders, a snack cup holder, a padded front bar for each seat and a carry bag included for free. For some strollers they are things you need to pay for. Not with the ZOE XL2. If there’s a drawback it is that the seatbacks are a little short. Older kids might find they cannot recline too far before their head pops out. Sitting upright is okay for all but the tallest preschoolers. That issue aside the ZOE XL2 is a great double umbrella stroller that’s well priced and has an unbeatable weight. 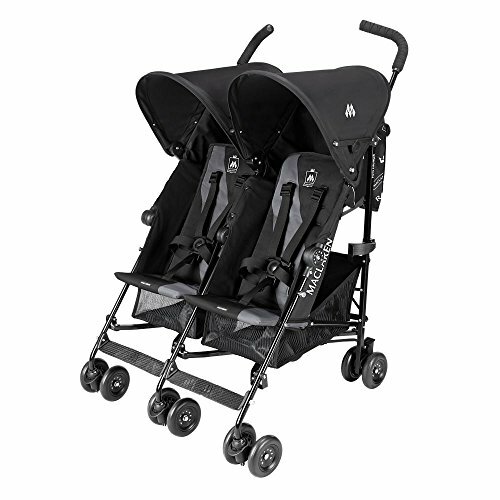 Read more about the ZOE XL2 BEST Xtra Lightweight Double Stroller and see the latest prices here. The UPPABaby G-Link stroller is another fabulous stroller from UPPABaby just perfect for parents who like lightweight, umbrella strollers which still have features. 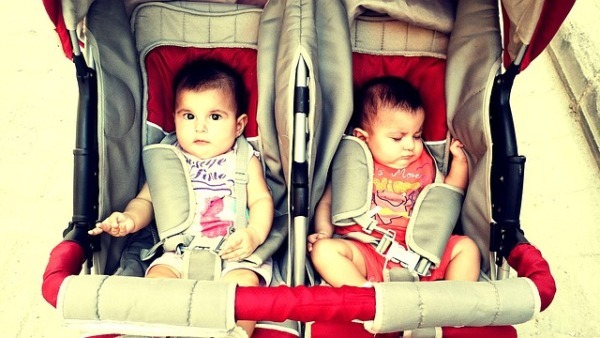 This is their first double stroller and they have a winner in our opinion. It’s a lightweight 24.5 pounds and while that doesn’t compare to the Zoe above, it is great for a stroller that features a deep recline. 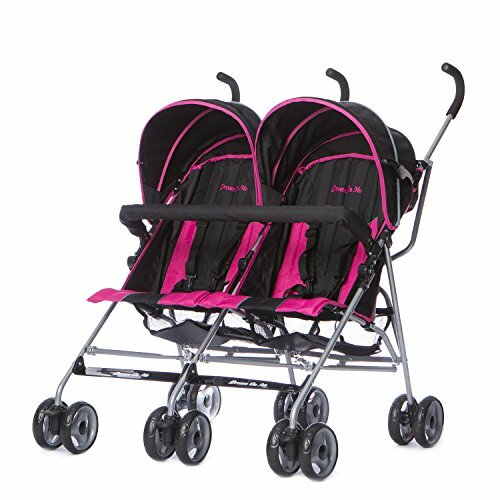 It is one of the few double umbrella strollers on the market that is suitable from birth and also suitable for twins! It also suits larger toddlers with a good seat height. It’s narrow at only 30 inches wide so fits through the majority of doorways. Each of the canopies is large with good coverage and can be operated independently. There are also 5 point safety harnesses and adjustable foot rests. There is a large basket the fold is nice and compact. This is a great choice if you want a relatively lightweight double stroller which still has features and is suitable from birth. Read more about the UPPABaby G-Link Stroller and see the latest prices here. This modern quality stroller weighs only 23 pounds and will hold your children until they are a combined weight of 110 pounds making it an excellent choice for families of big toddlers or preschoolers. It is also a great option for the best double umbrella stroller for twins since it will handle both of them until they are old enough to no longer need a stroller. For rests and younger children, the Maclaren Twin Triumph features a 4 position recline. For parents, this stroller features a one handed, compact fold and carry strap. The ergonomic handles can adjust to three different positions making this a great choice for taller parents. The seats are fully removable and washable and the storage basket underneath is a good size. For safety, the Maclaren Twin Triumph features 5 point harnesses and locking, front double swivel wheels. This stroller has front and rear wheel suspension for a smooth ride for your children. It also has two independent, rain resistant hoods with UV protected viewing windows. With all these features and the quality Maclaren name, the Maclaren Twin Triumph is a top choice for the best twin umbrella stroller. 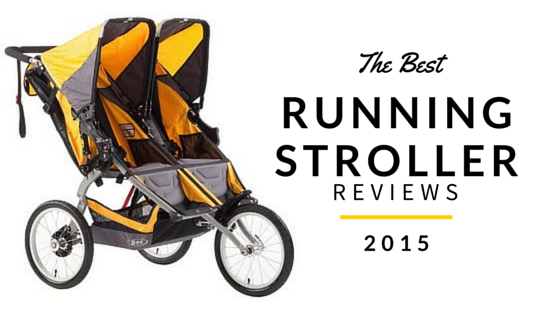 Read more reviews and check out the latest price of the Maclaren Twin Triumph Stroller. This is one seriously lightweight twin stroller, which offers plenty of storage space for your shopping on the go, or anything else you need to take with you on your travels. The compact umbrella design means this stroller is easy to zip around and folds down with one hand quickly and easily. There are reclining seats which are padded and have vents for breathability, as well as safety harnesses with five point fastenings, for total safety. The canopy is large and adjustable, to cover eyes from bright sunlight or wind, and the general appearance of the stroller is also very sporty and zippy, which is ideal for getting around without fuss, and without the bulk that some double strollers have. Most reviews state this stroller is fantastic for the money, so if you are on a budget, this is certainly one to go for. Read more about the Dream on Me Twin Stroller and see the latest prices here. 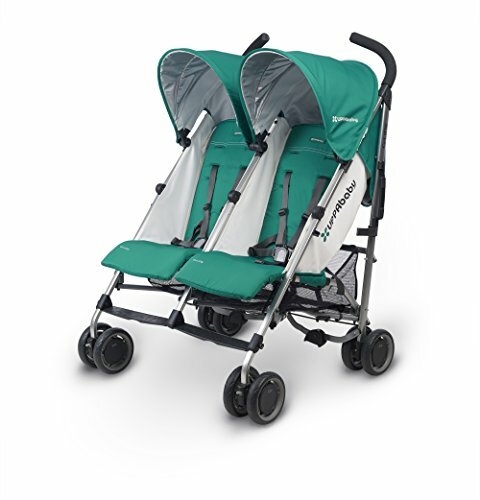 The Chicco Echo Twin Stroller is a top rated double umbrella stroller. It features 4 position recline on each seat with a near-flat recline. There is also an adjustable leg support that has two positions. This stroller is suitable from about 6 months old until 40 pounds. For parents, this Chicco double umbrella stroller has a compact fold with a carry handle. It has a good storage area under the seats. It is a heavier double umbrella stroller option coming in at 34 pounds. This stroller features comfortable, padded seats and 5-point safety harnesses for both children. It has great manoeuvrability and the dual front wheels come with locking swivels and suspension. The sun canopies can be adjusted individually and have rear flaps that can be zipped off to provide protection from the elements. The Chicco Echo Twin Stroller is a stylish choice for parents who want a study, comfortable stroller and aren’t worried by the extra weight. 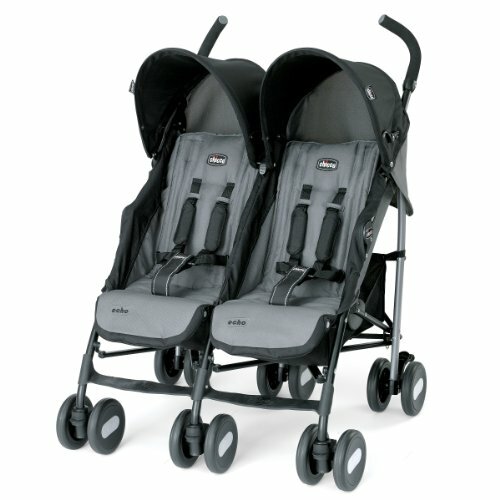 Read more reviews and check out the latest price of the Chicco Echo Twin Stroller. 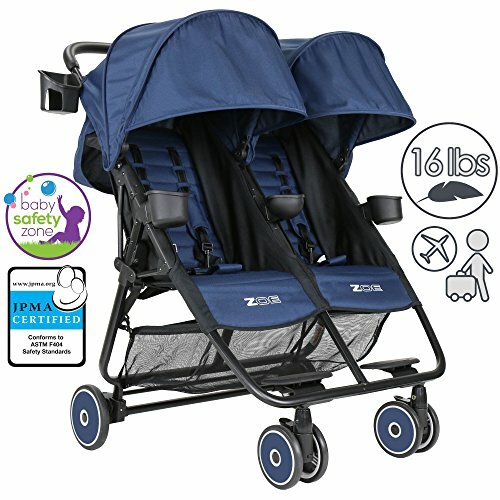 The excellent value Delta Children City Street Side by Side Stroller is rated by us at 4.3/5 – which is great in this price bracket. This stroller features a lightweight frame and weighs only 19 pounds. It is a great choice for travel and has a compact fold. It fits through a standard 30″ doorway. Additionally, this stroller has 360 degree swivel, shock absorbing front wheels for easy handling and a smooth ride. The Delta Children City Street comes with a 3-point harness in each seat. Parents have a cup holder with two attachment points and 2 storage bags that hang off the stroller. This stroller is a great budget option at well under $100. It is suitable for kids up to 35 pounds. It also meets or exceeds all ASTM standards, as well as CPSC standards ensuring your children are safe. The Delta Children City Street Side by Side Stroller is perfect for parents who want a cheap double umbrella stroller and do not need extra features such as a recline or 5 point safety harnesses. It is the best lightweight double umbrella stroller option on a budget and perhaps also the best double umbrella stroller for toddlers. 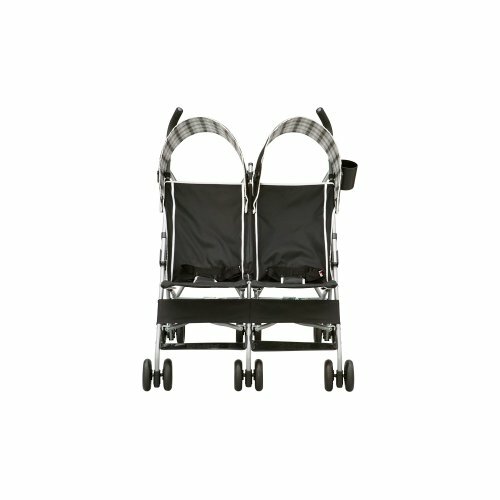 Read more reviews and check out the latest price of the Delta Children City Street Side by Side Stroller. The Regal Lager Twinyx Baby Stroller looks the part, with a bright red and black design, perfect for boys and girls, and seriously sporty in appearance. 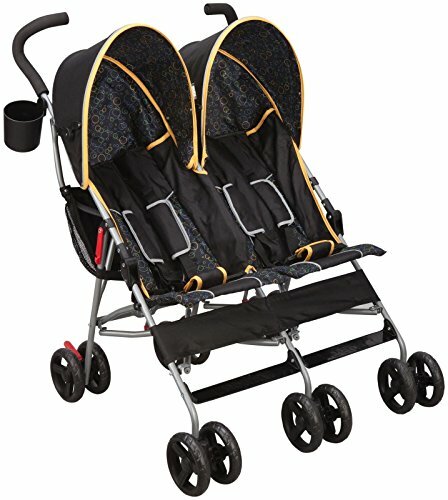 The great thing about this particular stroller is that your children can be independent from each other, so if you have twins, they can sit however they want, and if you have children of different ages, they can either sit up or be reclined, depending on how they individually want to be – no crying, no tantrums, just two happy children! The stroller has dual wheels front and back, which twist and slide with ease, and handle corners and changes of direction with no issues. The front swivel wheels are lockable and are perfect for every type of terrain. The handles are foam-padded and adjustable, for parents’ comfort, and the two bumper bars on the front of the stroller are individually removable too. The Kolcraft Cloud Side By Side is a nice balance between size, cost and usability. The Kolcraft Cloud has many of the typical features for a double stroller in this class. It weights just 21 pounds and folds up quite small. It is not as portable as the ZOE XL2, but it is still near the top of the class. There’s some nice aspects to the Kolcraft Cloud. The canopies can extend to give good coverage and ensure that your children’s faces and upper bodies are well covered from the sun, even from straight ahead. The backs of the seats can roll up which exposes the mesh front of the seat to the air and gives fantastic ventilation. There’s two drawbacks for me. The first is that the Kolcraft Cloud comes with just a three point safety harness. While it is meant to be fine for kids from the ages of six months, this will depend on the body strength of the child and how much they move about (reclining the seat will help). Another drawback is the lack of storage space under the stroller. It’s a minor point but I miss the storage space when it isn’t there. Although not perfect, this stoller has some nice features, is light and easy to get around and is well prices for its size and usability. Click here for the latest prices for the Kolcraft Cloud Side By Side Umbrella Stroller. Want to check out more double stroller options? Read our ultimate guide to picking the best double stroller or check out our guide to the best side by side double strollers.